Well Hello there. My name is Tori. I am a Lab/German Shepard Mix who loves people and almost all my fellow dogs. I'm a loving and sweet girl. I am also very smart, therefore I enjoy having something to occupy my time. I love taking long walks in the park, running, playing, or just indulging in a good ole bone. I am spayed and up to date on my all vaccinations. Please say your the home I have dreamt about for so long. My adoption fee $200. Please apply for me today! 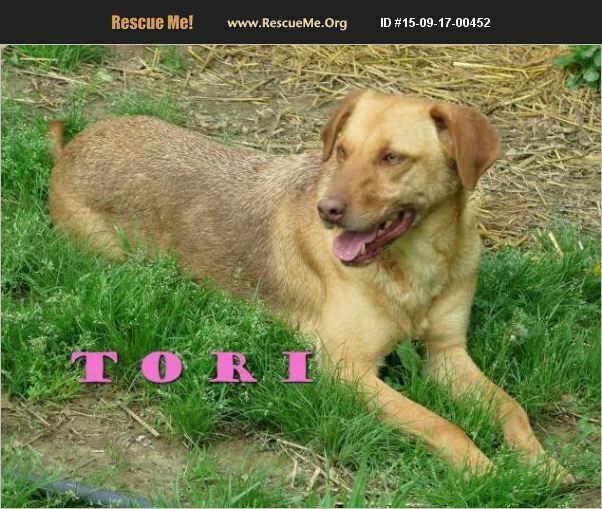 Tori is heartworm positive, but RARE will cover the treatment with our veterinarian at no extra cost to the adopter. Heartworms are treatable and dogs can live healthy, fulfilling, and amazing lives after treatment. Please don't let this stop you from giving an animal a good home that it deserves and needs so desperately. We will be happy to answer any questions that you may have. ****************AN APPLICATION AND HOME VISIT ARE REQUIRED! *************** Please visit www.RuralAnimalRescueEffort.org for foster and adoption applications or for additional information. All of our pets are or will be spayed/neutered, up to date on all vaccines prior to adoption. Please complete the application on our website and we will call you to answer any questions you may have. Our adoption fees not only help the animal being adopted, but they also help to cover heartworm treatments and other treatable ailments that many animals, that would otherwise be euthanized, need to be made available for adoption. Thank you for choosing to adopt, foster, or aid in the rescue efforts of RARE!